This week at the library; or, Chick Drama! Tuesday - morning on the desk. our teen furniture arrived and I got the teens to help me carry it upstairs, unbox it, screw the legs in, and arrange it. Planning programs. Ordering summer materials. Remember that I'm using egg cartons and start with them, instead of racing out to grab them 3/4 of the way through the program. Pre-punch the holes in the egg carton so I can stick the eggs on the ends of the sticks, rather than the middle, thus lessening the chances of kids getting their eyes poked out. Have little sticky labels the kids can write their name on and stick to the skewer. Ideally, I'd have a second person the whole time, giving out paint and emptying and refilling dirty water cups, but that's just a beautiful dream. I did pull in my aide, who really should have been shelving the overflowing carts of picture books, to help some. Thursday - I went to our local comics shop to pick up this month's magazines, then drove out to Janesville to get our incubator, stopped at Michaels for fabric paint and twigs and floral foam (more on that later), then to Walmart for the rest of the t-shirts for next week's programs. This sentence does not convey the frustration and endless annoyances of the day. ARGH. Friday - Yawn. So sleepy. The library is, as it was yesterday, very, very hot. Sooooo sleepy. Graeme wishes he could escape from his boring small fishing town, Lower Narrow Spit. After all, he's going to be a marine biologist and he knows everything there is to know about the town and marine life there already. 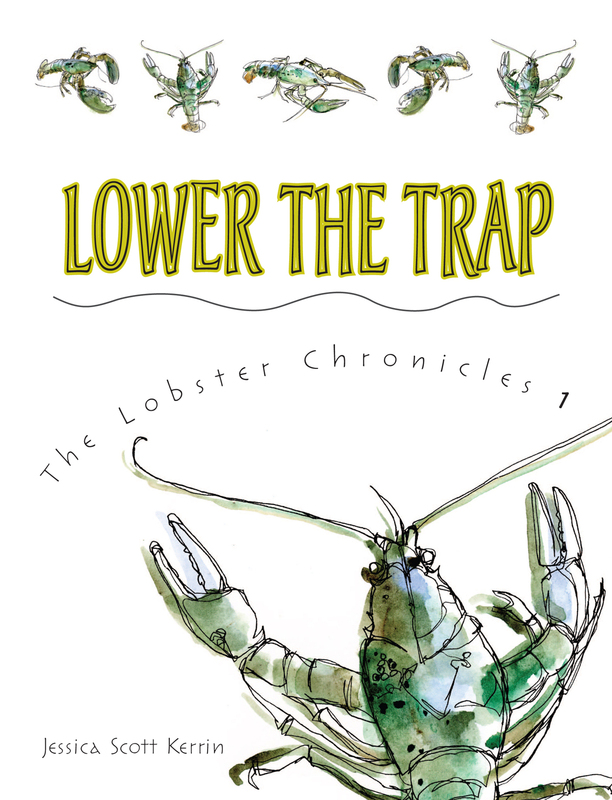 But then Graeme's dad catches a huge lobster and suddenly Graeme realizes he doesn't know so much about his town after all. Why is the school bully, Norris, whose wealthy and nasty dad owns the cannery, so eager for Graeme to solve the mystery of who broke their teacher's beloved cactus? Is the giant lobster the same one three elderly men caught years before? Graeme desperately wants a trip to the Big Fish Aquarium and the lobster seems like his ticket to get there, but is it worth all the trouble he's getting into? On the other hand...it's just not very well-written. The dialogue is clunky and awkward (how many kids even know what "audacious" means? ), the characters' behavior isn't explained well, and the plot doesn't hang together well. Graeme's detective ability isn't supported by the story and the characters don't change or grow by the end of the story, staying static and one-dimensional to the end of the book. The giant lobster and fishing themes were interesting, but not well-fleshed out with lots of time given to the convoluted plot of the missing cactus which turns out to be mostly irrelevant, as is the plot thread with Graeme's sister. Because we never really learn anything about the other characters, their mass outrage when they discover what Graeme is doing doesn't ring true. Verdict: I think this writer - and the series - shows promise but needs some work. If you have the budget, make this an additional purchase. Otherwise keep an eye on the author for and possible purchase later on. 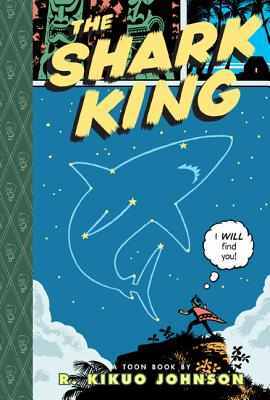 Johnson combines and retells the legends of the Shark King for young readers in the newest graphic novel easy reader from Toon Books. A young woman named Kalei goes down to a deserted spot on the beach to search for opihi...and narrowly escapes a huge shark when a strange man rescues her. They fall in love and are married and shortly before Kalei's baby, Nanaue, is born she realizes the truth - it is the Shark King himself who saved her! Nanaue is always hungry and has a strange mark on his back...which turns into snapping shark jaws! He steals food from the villagers until they learn his secret and he flees, discovering the place his father made for him and his father. They leave a gift for Kalei and she knows her Shark Kings are always with her. The story is strange enough (or will be to my small-town Midwest patrons) to intrigue while the other has removed some of the violence and weirder elements of the original tales and smoothed the whole into a seamless plot. There's certainly still a creepy element to the story, which will delight young readers who like a little shiver in their story. My favorite part of this book is the illustrations, bold and colorful, with sharp lines and a great font that fits perfectly with the design of the story and is still super-easy to read. Kalei's reactions to her husband and son are hilarious, especially in the spread with Nanaue's first steps - Kalei moves rapidly from delighted mother "you're walking!" to horrified resignation when Nanaue devours every speck of the huge heaps of food and asks for more "you're talking!" a few simple lines and shifts in body language will make parents snicker. Even though their kids aren't half-shark deities that devour everything in sight they can certainly sympathize with Nanaue's insatiable appetite and rapid growth! Pronunciation and explanations of unfamiliar terms and names are integrated into the story. Verdict: Johnson perfectly hits the spot with this new title and I'm hopeful of more Toon Books from this author. This will be a hit with kids who like larger-than-life stories, a little bit of creepiness, and funny moments. Toon Books has had some very good titles since they began, but this is the first one I feel really measures up to the groundbreaking Stinky by Eleanor Davis. Highly recommended. It's difficult to find really good easy nonfiction, suitable for reading aloud. Ever since I started including at least one nonfiction title in my Preschool Interactive programs, I have been on a quest to find these elusive titles. This makes it all the more exciting when I find a really amazing one like North! 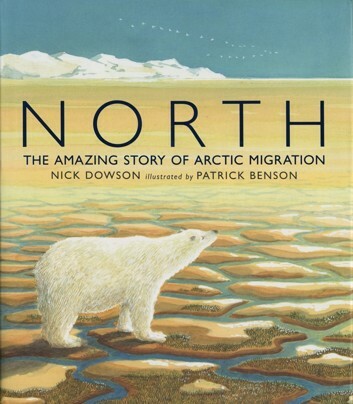 Simple, lyrical prose tells the story of the animals who migrate from across the world to the Arctic tundra as it slowly comes to life and blooms in the spring and summer. "Some of the first to leave on their journey are gray whales. This one is young. Water slides over her barnacled head as she glides through the blue of a Mexican lagoon--over crabs and sand, past boats and other whales, and out into the cold roll of the Pacific Ocean. For eight long weeks, she'll swim north without feeding..."
These longer sections of text are broken up by spreads with only a few words, or no words at all. The art and design of the book is also amazing. Benson's pen, pencil and watercolor artwork brings out the details of the various animals and the homes they migrate from. The artwork and text builds together to a triumphant conclusion, showing the teeming life at the height of summer in a place many people think of as cold and dead. The overall design begins with a grey and stark view of the planet from outer space, then the swirling snow and barren landscape. At the end of the story, as the migrating animals leave, the landscape fades again to greys and whites and then returns to the view from outer space. The book includes an afterword with more information about the Arctic, some websites, a glossary, and index. 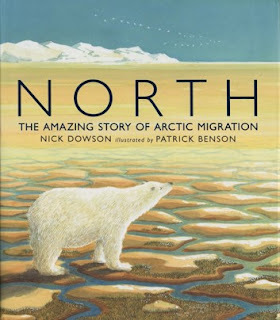 Verdict: This book is amazing on so many levels; stunning artwork and exquisite text make it a book that parents and librarians will enjoy reading aloud and kids will relish hearing and seeing. Highly recommended. Monday - rather to my surprise, despite it being a no-school day, I actually managed to finish the April publicity while on the desk this morning. Then I drove out to our systems office to discuss grants and other stuff with our ys consultant. Devoted some time to pondering my egg craft - I bought styrofoam eggs and we're going to paint them, but I want to string them on fishing line or something first so the kids don't get paint all over their hands. I don't have a needle long enough...I could make the hole with a hat pin (yes, I own several hatpins. I'm just waiting for the right hat. I have yet to find somewhere that makes them to fit over a thick bun) but then how to thread the line through? Tuesday - Our storytimes are overflowing and we have to do something about it! I am collecting gazillions of thoughts and ideas and we'll have a meeting and start implementing changes in the summer. Things were especially crazy this morning because there was election training in the community center, which meant no parking. Lots of hot and tired moms and kids trekking over from several blocks. At least the weather was nice. Then I realized that the circle die cut I had bought specifically for tomorrow's storytime hadn't even shipped yet, so I'd have to cut them by hand. Sigh. Ha, used our O die cut instead - it cuts a circle and a smaller circle within. Kind of a waste, but whatever. Webinar with other ys librarians talking about summer. Put out publicity in library. Stared at massive amount of stuff on desk. Suddenly remembered I told the 2nd graders coming tomorrow we would be doing ducks. Cut out a gazillion ducks. Then Lego Club. It was hot. No more need be said. Ooooh, I could do the eggs on skewers! It was a long evening, esp. since I had nothing to eat but a late breakfast and some crackers today. Friday Pretty slow day, drizzly and cool. Yes, I am actually reviewing a young adult title! Although I'd give these to middle-schoolers - they're perfectly appropriate for 6th grade and up. Nora is settling in to her family's new house, a historic Victorian mansion once inhabited by a famous author, when she discovers the previous tenants haven't quite left...she's never been able to talk to boys, but Tom, the friendly ghost, isn't like anyone she's ever met and she's perfectly happy...until the other ghosts appear, and they're not so friendly. With the help of a psychic, Nora sends the evil and lost ghosts and the darkness they've brought away. I have several tween and teen girls at my library who adore this series - they're also manga fans. I admit that I like them too. It's a somewhat guilty pleasure, as I can clearly see the flaws after I read them...but they're so much fun in the reading! 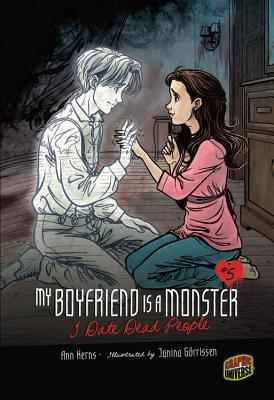 This one was mostly sweet and romantic and the art was much better than the fairy title Under His Spell (the zombie one, I Love Him to Pieces is still my all-time favorite though!). I did think the characters were a bit one-dimensional. The back says Nora is kind of living in the past, but we don't really see anything in the book that backs that up. Also, other than a rather dreamy attraction there doesn't seem to be a reason for Nora to fall in love with Tom. One minute she's shrieking in terror, the next she's calling him her boyfriend and the next they're kissing. However, I do really like that this series has a strong dose of reality. In previous books, the female lead does not go gaily waltzing off into the sunset with a paranormal creature because they are IN LOVE. In My Boyfriend Bites, the guy kindly but firmly points out that the girl needs to do some major growing up and he's got problems of his own, in Under His Spell the girl backs off from spending the rest of her life in a fairy kingdom. In this book, Nora does NOT end up with Tom, he moves on to his family in the afterlife and she finds a real, live boy who likes her. Verdict: If you have tween or young teen girls who are looking for a gentle romance with humor and you would also like to subtly reinforce the idea that there's more to relationships than psychic tinglies, this is the series to get. This particular entry was more sweet than funny, but the art was strong and it's a strong entry in the series. I've put off my review of this title several times because I'm so worried that I won't do it justice. It's always harder to write good reviews than negative (or critical, or bad, or whatever) reviews. It's easy to point at something and say "hey, this text is clunky, this artwork is pedestrian, and there's a TYPO!" but it's much harder (at least for me) to say exactly why something works, especially when it's a book as unique and beautiful as Virginia Wolf. Virginia wakes up in a bad mood one day. She feels - and looks - quite wolfish. Nothing Vanessa does makes her feel better, until she coaxes her to tell her what would make the doldrums go away "If I were flying, I would travel to a perfect place. A place with frosted cakes and beautiful flowers and excellent trees to climb and absolutely no doldrums." So Vanessa creates Bloomsberry, a magical garden that looks "just the way it sounded" and slowly Virginia is happy again. There is, of course, inspiration here from the life of Virginia Woolf and her sister, painter Vanessa Bell. 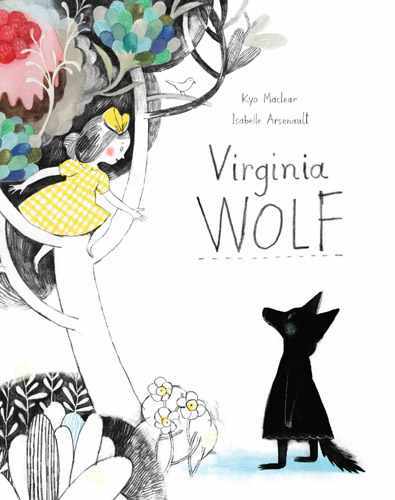 Not being much of a fan of Woolf, this aspect kind of passed over my head (most children won't pick it up either). But what did completely capture me about this story is that Maclear totally gets the doldrums, when everything is bleak and the mere presence of other humans is unbelievably annoying "Do not wear that cheerful yellow dress. Do not brush your teeth so loudly. Stop that racket!" and people trying to cheer you up just makes it worse. Any kid who's felt grumpy "just because" will sympathize. Added to this is Arsenault's fascinating art, and here I wish I was really good about dissecting and talking about art so I could explain exactly what it is that makes me want to stare at this book for hours. There are so many ways this art is cool. The way Virginia is completely a wolf, but you can still see her girl-ness underneath. The shifts in color. The gray swashy bits that creep up and then are washed away by the most marvelous garden that Vanessa draws (and I will just add here that I looked up the art of the real Vanessa Bell and I much prefer Arsenault's pictures). Fortunately, Jules at Seven Impossible Things has done several features there and at Kirkus so you can read all about how amazing the art is from someone much art-articulate than I. Verdict: This isn't one of those books that's going to instantly fly off the shelf - it's a little quirky, a little different. But once a few people discover it, Virginia Wolf will be one of those books that's passed from person to person and remembered and beloved by a few children. We need those special books in our libraries, as well as the super-popular and super-commercial titles. Squeeze it into your budget and watch children's faces bloom with delight as they are transported to Bloomsberry. Betsy Bird at Fuse8 is once again running her top 100 picture books and chapter books poll! I think I missed out on the picture books the first time around and found it insanely hard to choose - so I just meandered through my list of favorites for staff picks and my LibraryThing account and then looked at my shelves and...total luck of the draw, I just filled them in as I came. 10 Small persons with wings by Ellen Booraem (Another modern classic! The author has created a truly unique voice in prickly Melly, a character whom both girls and boys can sympathize with as they go through the awkward transition from child to adult. Clever world-building, funny and poignant moments, and an engaging plot will make this a favorite for a long time to come. 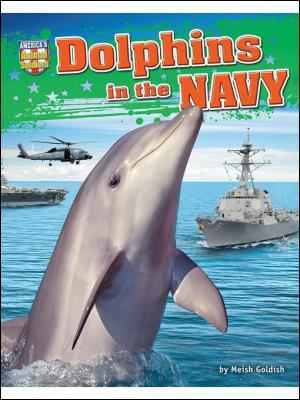 It's not often I find a children's nonfiction book that offers completely new information to me, but I had never heard of dolphins in the Navy before and found it completely fascinating. The story opens with the real-life work of a dolphin named K-Dog, who finds sea mines for the navy. Goldish then explains how dolphins use echolocation to locate people and mines underwater and how the Navy uses these skills and trains and cares for the dolphins. There is a section included on controversies about using dolphins in the military and the possibilities of someday replacing them with robots. Further information gives facts about dolphins in the wild, a glossary, index, and bibliography as well as links to additional information on the publishers' website. Verdict: This is a sample of what Bearport does best; high-interest subjects (animals and military) with a new twist, offering new angles or surprising facts. I can see this series, America's Animal Soldiers, being a big hit. Recommended! Monday Thanks to Daylight Savings and a rainy, rainy day, we had a pretty slow morning and I was able to get through a lot of collection development and other misc. things. Then I tackled the begging letters for summer reading prizes (the only thing I hate more than doing this is the follow-up calls. Sometimes my director has to give me chocolate afterwards) and April publicity, of which there is going to be a lot due to the many things going on. Didn't get everything done, but a large chunk of it. Tuesday Hot. I love our huge windows in the children's area, but they do heat up the place like a sauna. Why did I wear my hair down? And, of course, I left my extra pins at home. Had a lengthy discussion with Miss Pattie about various issues we're dealing with in storytime. Met with a woman who is one of the volunteers running the library at the special education school - we spent a couple hours putting together a list of graphic novels for teens, discussing review sources, recommended publishers, etc. and then talking about working with special needs children in the library. Only got a little more done on April publicity. read The Easter Bunny's Assistant by Jan Thomas (not sure they quite got it, but they liked saying "stinky!" read Listen to my trumpet by Mo Willems (one kid was upset by the noise, but the others loved making trumpet sounds! Then I did Messy Art Club. We made flip books, which I adapted from Abby the Librarian. We had a pretty normal group - about 30 - but it was a quick craft and most people only stayed for a little while, so we were done by about 4:45. Which was good, because a large number of sparkles had ended up on the floor. By the time I gave up trying to clean them up (sweeping, vacuuming, and picking them up one by one by hand were all employed) wrote up some notes and left, it was about 5:45. Loooong day. Apparently I'm not the only person who was hot - found someone's cut off jean legs in the children's area. Thursday The pile on the desk was tackled, amongst other things. Overheard in the lobby "I'm NOT short, I'm fun-size!" Kept me giggling all night. Author/illustrator Ruth Brown presents a simple guessing game in this jungle story. In brisk rhymes, Monkey greets each of his friends, “Monkey said, ‘Give me a smile!’ when he saw the…crocodile.” The art is cleverly made to conceal the various animals, which are revealed when the reader turns a half-page flap. The half-page blends onto both sides of the page, so the reader sees one scene, showing Monkey and his greeting and a subtle clue, then turns the half page to change the picture to one featuring the animal. The art seems to encompass a variety of styles – the animals are delicately painted, but the jungle setting looks like a print with splatter paint, giving the leaves a realistic veined look. Some of the pictures are almost frighteningly realistic, in comparison to Monkey’s cheerful greeting, like the crocodile’s savage lunge and the frantically leaping frog, but most of them look good-humored without being too anthropomorphized. Ruth Brown’s art is colorful and the fascinating variety of textures and details make this a fun book for close-up viewing, as well as a good read-aloud. Verdict: This is a great book for an interactive storytime - the guessing game is difficult enough to keep preschoolers absorbed, with the delicate hints in the art and rhymes just waiting to be finished, but the text is simple enough for toddlers to absorb. Recommended. Daisy loves words. She loves the way they sound, their many meanings, and the way there's always a word that's just right to describe whatever is happening. She also loves her teacher, who is always sparkling and cries when she gets excited and happy. "Emotional" is one of Daisy's words. Now that Miss Goldner is getting married at the end of the school year and won't be coming back, Daisy agrees with less-than-favorite classmate Samantha that everyone should give her a present. But what to give? 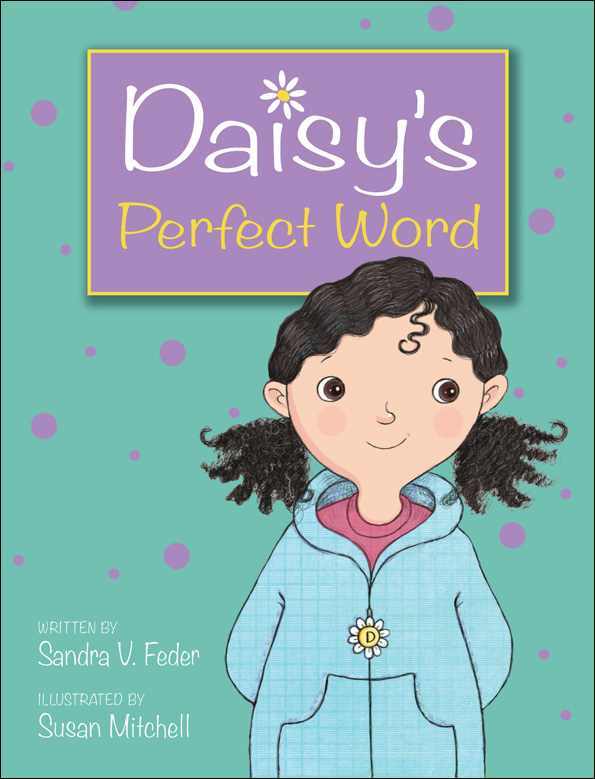 With her best friend Emma's help and lots of thinking, Daisy comes up with the perfect present: a perfect word. Mitchell's cheerful black and white illustrations show a perky small girl and her happy friends and family. Daisy and Emma bike around town, visit elderly friend Mrs. Bookman, and the candy shop Sweetums. Daisy reads and picks lemons, plays with her younger sister, and avoids the overbearing Samantha. The story is a little heavy on the sweetness and light - Daisy's search for a perfect word is the only issue and even her dislike of Samantha is easily resolved by the end of the story. I'm always a little suspicious of stories where everyone is more or less perfect, especially "I adore my teacher" type stories, and schools that are portrayed sans any kind of bullying or gossip (yes, even first graders gossip and bully each other.) Also, while I certainly enjoy the idea of a world where children spend their time gardening, biking, and reading instead of staring at a screen, I don't think that world exists any longer. However, this is a fun, cheerful story to read for a child who wants something light and happy and parents who are tired of whiny, badly behaving children like Junie B. Jones will be pleased to hand their readers this title. Verdict: There are plenty of beginning chapter books featuring girls and their relationship with school, friends, and teachers. This new title is sweet and nicely written, but doesn't particularly stand out in the crowd. 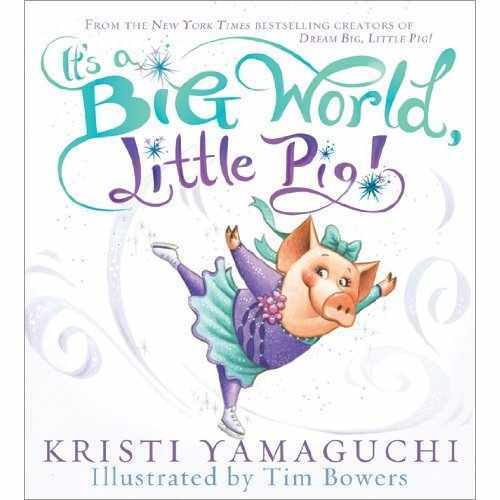 If you have a limited budget, I'd recommend Princess Posey and Ivy + Bean before adding this title, but if you have a little more wiggle room, this is a good addition to your beginning chapter books. One of the collection development projects I've been working on is updating our crafts and activities section in the nonfiction. I've found a sad lack of really original craft books - I'm not looking for those over-priced, library bound editions with 10 crafts per book, and usually all things I've seen before. I was lamenting that I had all the Kids Can Press jumbo craft collections, when look what showed up on my desk! 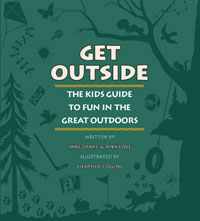 Get Outside is a compilation of activities, facts, projects, and stories from four earlier books; The Kids' Cottage books by Jane Drake. This is the best of the best, presented in a format that will stay fresh and fun for years. The book is divided into seasons, spring, summer, fall and winter. Each seasonal section has four collections of activities; nature lover, outdoor fun and games, snug inside, and look to the sky. The table of contents is nicely arranged with clear lists of all the projects and activities included and there is an index for further searching. Collins' simple black and white art, featuring a diverse cast of children enjoying the various activities, has a timeless quality that won't quickly date the book (unlike my craft books featuring photographs of children dressed in 80s styles). The activities are neatly arranged in sections with numbered steps as needed, lists of materials, extra tips, related facts, and more. The instructions are clear and simple, easy to follow for any age, and the presentation is organized well. The seasons do assume the readers live in the northern states or Canada (makes sense since Kids Can Press is a Canadian publisher) so most of the winter activities involve snow. However, there are plenty of activities to choose from and most of the games can easily be adapted to any weather. So, what kinds of activities and games are included? Everything from the traditional - building bird houses, planting a garden, playing card games, and looking for constellations, to the not-so-well known (at least to me) like putting on your own winter olympics, making a worm farm, and making your own midway games. Verdict: If you're looking for simple, inexpensive, and fun activities to pry your children or library patrons away from the screen, this is the perfect title. Highly recommended. Well, they don't exactly fail me, I just don't want to title a post "the week that began with vomit." Monday - aforementioned vomit, publicity, staff meeting, still cleaning up from Friday's Seuss party. Art teachers started setting up the schools' art show. Tuesday - spent most of the morning taking publicity around to various schools and making an unscheduled stop to diagnose the strange rattling in my car. Then I had a lengthy meeting with Miss Pattie to pin down details about upcoming programs and brainstorm ideas for the rest of the year. Wednesday - Preschool Interactive, I'm so excited that the little boy who's been watching and listening from outside the room for a year finally decided to come in and join us today! Diagnosis of the rattling in my car - I ran over a phantom object (because I don't remember running over anything) and bent something. Weird. Lego club! The elementary schools' art show opened tonight, so there were vast hordes of people. I love having the art show here because we get a lot of people who don't usually come to the library and aren't aware of what we have to offer. Plus, the art is cool. They've got some chalk leaf paintings that I am seriously loving. Also, it was Daisy Scout night. Also, a coach brought part of his softball team over - their playing area wasn't available so he remembered the library as being pretty empty in the evening. Ha ha ha. Several other incidents occurred. It was a busy, not always fun, but definitely busy, evening. Friday Half day because I'm working tomorrow - still planning out my crafts/art projects and supply lists and budget. Saturday Crazy, as always. Got to work early to try to get some extra work done. Didn't happen. Oh well. Jasper John Dooley has been waiting forever for his turn to be Star of the Week at school. He has it all planned out from Show and Tell to special treats. However, the week gets off to a bad start when Jasper's Show and Tell of his lint collection is completely eclipsed by his friend Ori's new baby sister - and then all the kids laugh at him! The misunderstandings continue from bad to worse until Jasper and his wooden "brother" Earl get sent to the principal's office. But with some help from friends and perseverance, the week turns out well after all. Adderson's slightly quirky little boy is perfectly drawn. Jasper is excited to be the center of attention, but disappointed and embarrassed when things don't go the way he'd planned. 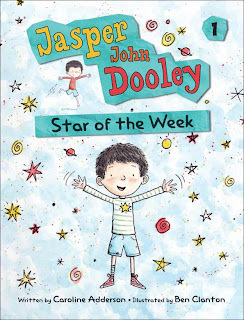 His absorption is funny and honest - when he gets to the principal's office, he's completely shocked that the whole school doesn't know about Star of the Week. He can't believe nobody understands how amazing his lint collection is. Clanton's black and white cartoon illustrations are the perfect fit, showing an enthusiastic small boy in various humorous situations. The plot thread of Ori's baby sister is the funniest part of the book; Jasper is fascinated with this new addition, while Ori just wants some sleep and a break from the crying. Jasper at first really, really wants a baby - then realizes maybe he doesn't after all, which sets off another train of mishaps. I liked the easy way diversity was blended into the story, without whapping the reader over the head as well. I'm excited to see more beginning chapter books, especially featuring boys, but I wonder if the boys will be excited? There are so many of these series for girls - Judy Moody, Clementine, Ramona, Princess Posey, Junie B. Jones, etc. but it seems like there are fewer for boys - Roscoe Riley, Horrible Harry, Stink, etc. In my library, at least, while the girls will voluntarily choose these stories (and they pick the ones with boy main characters as well as girls - lots of girls like to read Stink for example) it's moms picking these books for boys, who, if left to choose on their own, seem to gravitate towards nonfiction, Star Wars, and comics. Occasionally a realistic chapter book series will grab them - Roscoe Riley was very popular for a while - but the "gentler" realistic reads, focusing on kids' emotional reactions to family and school, appear to be choices of moms and teachers. Anybody else have thoughts on this? Verdict: Although I have reservations on how much boys are actually interested in these "everyday life and feelings" type of stories, parents and teachers choose them frequently. I think Jasper John Dooley has enough humor in it to keep boys interested and the illustrations are attractive. Recommended! Poppy has worked hard at her ice skating and is excited when she gets a chance to go to the World Games. She's a little scared too, but her family reminds her to follow her dreams and her best friend tells her "everyone smiles in the same language." She finds out it's true when she gets to the World Athlete Village and meets a friendly panda snowboarder from China, a fluffy dog skier from Italy, an ice skating stork from Japan, and a nervous kangaroo speed skater from Australia. Each one of her new friends has something in common with her, whether it's music, food, or family. In the end, Poppy has a wonderful time, skates her best, and even gets to experience some of Paris. Although peppered a bit strongly with exclamation points and, of course, containing a rather sappy moral, the text is better than most celebrity picture books and doesn't belabor the didacticism too strongly. There are fun references to culture and the Olympics, changed just enough to make a guessing game, "Poochini" instead of Puccini, for example. I find the non-competitiveness and friendliness of all the athletes a little difficult to believe, but this rose-tinted world of friendship and self-esteem will be satisfying to most parents and children. The pictures are the best part of the book, with dazzling colors, a delightfully plump Poppy, and swirls of movement following the various animals on the ice. Bowers' world is a cheerful place with a wide variety of smiling, round-eyed animals and plenty of sparkle, both on the costumes and in the backgrounds. Verdict: While this book probably won't go down as a classic, it has more staying power than most celebrity picture books and will delight small fans of ice skating and those who like colorful pictures with animals. It's a little long for storytime, but parents and children will enjoy it together. An additional purchase, especially recommended if you have ice skating fans. If you love detailed maps, science, history, or adventure, this is the book for you. 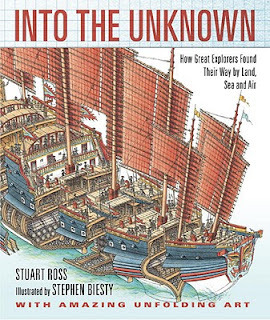 In precise and evocative language, Ross tells the story of fourteen explorers and how they navigated and traveled over vast distances, unknown lands, and into uncharted territory. The explorers are covered chronologically, one chapter to an explorer and include Pytheas the Greek's fabled journey to the Arctic Circle in 340 BC, Admiral Zheng He's crossing of the Indian Ocean in 1405, the Picard's journey to heights and depths in balloons and bathysphere, and finishes with the landing on the moon. Each exploration has a separate chapter, packed with information about navigation, building of boats, balloons, and rockets, and stories of setbacks as well as successes. This book doesn't cover a great deal of new ground on the subject of exploration, although it does add a few non-Western people and one woman. It's a good general overview of famous explorers with a few additions. The focus on how they accomplished their explorations is an interesting new perspective. The presentation and design of the book is amazing. Each explorer has a chapter with backgrounds that looked like different kinds of paper or parchment and exquisitely detailed artwork. Fold-out sections show cross-sections of ships, and more details on maps, routes, engineering, and other factors in the accomplishment of these feats of exploration. Verdict: While the fold-out sections may not last long in your library, this book is worth getting anyways for the amount of information packed into its brisk chapters. It's a great overall survey of the high points of exploration in history. I picked it up at random to show on a school visit and it enthralled 5th through 8th graders. Monday - Belatedly began work on March publicity. Official circulation numbers from the annual report are in - my children's circulation went up 7,929 last year, more than the 7,000 I estimated. Left early to pick up the rest of the Dr. Seuss program supplies and sample t-shirts for spring break at Wal-Mart and to go to the comic shop to pick up the library's monthly orders. Got home a little past six, which wasn't bad at all. Favorite question of the day: "Is the library open to the public?" Tuesday Bad start to the day with a popped lens, but happily found a place only a few blocks away to fix it before I went to our youth services meeting. We toured Yerkes Observatory, discussed possible collaboration, and went out to lunch and worked through our agenda - summer reading, grants, and other stuff. We also had good librarian time - you know, where you can talk to people with similar issues and problems, laugh at our insane stories, and enthuse about the merits of various storytimes. Anyhow, I have to admit in all honesty, that astronomy leaves me cold. Probably because my glasses get in the way of telescopes, binoculars, etc. and I have pretty bad eyesight. Kind of the same way I feel about birding - while everyone else is shouting "look at the purple-beaked tick picker with spliced tails!" I'm staring at anonymous little black dots - assuming I see anything at all. However, stars make excellently easy decorations, so I'm not complaining about this summer's theme at all. I did get some work done when I got back, but not enough to really make a dent. Wednesday A good day, but crazy busy. Had a large crowd for Preschool Interactive and realized once again how annoying it is that the post office refuses to allow the library to put events in the school newsletter sent out by Miss Pattie. Parents are confused, thinking that she is the library and her programs are all we have. Sigh. We are going to try to work around this again. I actually got lunch today, which was awesome, because I had somewhere between 40 and 50 people for Messy Art Club! Thursday - My first visit from a class of 2nd graders at a local elementary school. We've been planning this for a while; this school is a little farther out so it takes longer to walk. Everything went really well - we did a quick tour, I had pulled books for them to look at and pick from, and then they made butterfly masks. Next visit, they'll return their books, I'll take them on a tour of a different part of the library, and we'll try picking from the open shelves. Evening desk shift, getting ready for Seuss party, etc. Friday - I came in around 10:45 and started setting up for the Dr. Seuss party. I had several hours of desk time, but luckily it was very quiet so I got all the little decorations cut out. A gazillion calls from people wanting to know if we were closing and/or cancelling the party. There was no way we could cancel - all the food had been purchased and by the time I got the room reserved again it would all have spoiled. I am fascinated by native midwesterners' reluctance to drive in snow. Come on, people! If a Texas girl can do it, so can you! Anyhow, we ended up with 50 people, which is pretty good. We only expected 70 and the weather really was pretty bad. We had green eggs and ham, a choice of juice or milk, and cake while watching The Lorax (the old one. we were going to watch Cat in the Hat and Green Eggs and Ham - the old ones - but the movie that played perfectly when I tested it an hour before died when I tried to play it with an audience). Then it was 6pm and the library closed. We all went over for a special after hours tour, featuring the amazing microfilm machine! The inner workings of the bookdrops! The Magnifying Machine! Then at about 6:30 we went back to make a craft - I had beads and pipecleaners and popsicle sticks. Most people stayed for the tour, but only about 20 stayed for the craft. It took me about an hour to lug everything back over to the library, where I dumped it all in my office and Storyroom to await Monday. Everyone really loved the program and I couldn't have done anything about the weather. I would like to do things differently next year though. We ended up with too much food and it was too expensive, the tour didn't really work with that number of people, and I think there were too many things and people were flagging. I'm thinking of doing a Seuss Sampler party next year, with a table for each book. So Ten Apples Up On Top would have apples to sample. Cat in the Hat would have a craft to make a hat. Scrambled Eggs Super would have eggs to decorate. Green Eggs and Ham would have, you know, to sample. If I Ran the Circus would have a circus craft and so on. Then I wouldn't have to limit registration, which I always hate. Ashley Spires, who branched out from her hilarious graphic novels about Binky the Space Cat to write a picture book last year, Small Saul, continues the theme of characters who just don't quite fit in the way everyone else expects. 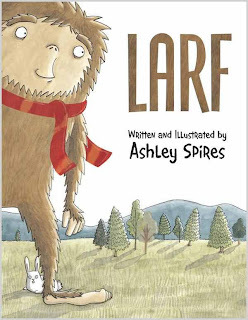 In her newest picture book, Larf, she introduces the only living sasquatch - or so he thinks - his pet bunny Eric, and a surprisingly sweet story about the joys of friendship. Larf is perfectly content to live life alone, avoiding reporters and fame, and filling his days with peaceful activities. Until one day he sees that a sasquatch is scheduled to make an appearance in the nearby city. Could there be another person like him? In a ferment of uncertainty, he makes a hilarious and risky trip to the city only to discover the sasquatch is a fake...but rest assured, there's a happy ending after all! Spires' watercolor illustrations with touches of collage (and "a dollop of Organic Sasquatch Detangler and Conditioning Shampoo") are the perfect accompaniment to her dry wit. I was especially fascinated by how well she blended Larf into his natural environment; he looks perfectly at home in his log cabin and the woods, but made him out of place in the city without making him ridiculous. The soft earth tones and caricatured people combine to create a smoothly blended story that combines humor, friendship, and a gentle moral - it can be scary to make new friends, but worth it! Verdict: While not quite as delicious as her Binky books or as funny as Small Saul, this is a delightful story that will be perfect for storytimes and read-alouds. After all, how many sasquatch picture books are there? Recommended.